Convert PDF documents into Word, Excel, PowerPoint and many more formats! You are now downloading PDF Converter for Windows. Read the Wide Angle PDF Converter End User License Agreement (EULA). How to Install PDF Converter. 1. Depending on the browser you are using, a windows should appear like this one. Click "Save". PDF Converter will then download to your PC. 2. 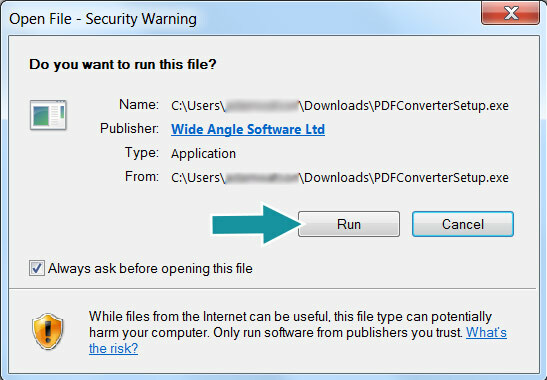 Once the download is complete, click "Run" to start the PDF Converter installer. 3. Alternatively, you can start the PDF Converter installer by double clicking the downloaded installer package. Depending on your web browser, the installer will either either have been downloaded to your Desktop or your Downloads folder. Double click on the PDF Converter installer to start installation. 5. Once installed, you can run PDF Converter by double clicking the PDF Converter icon on your desktop. 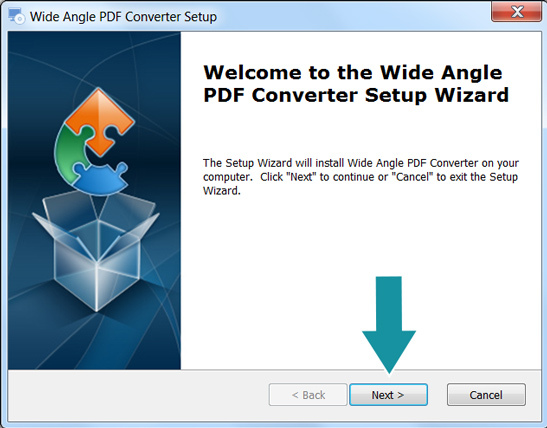 How to Uninstall Wide Angle PDF Converter. 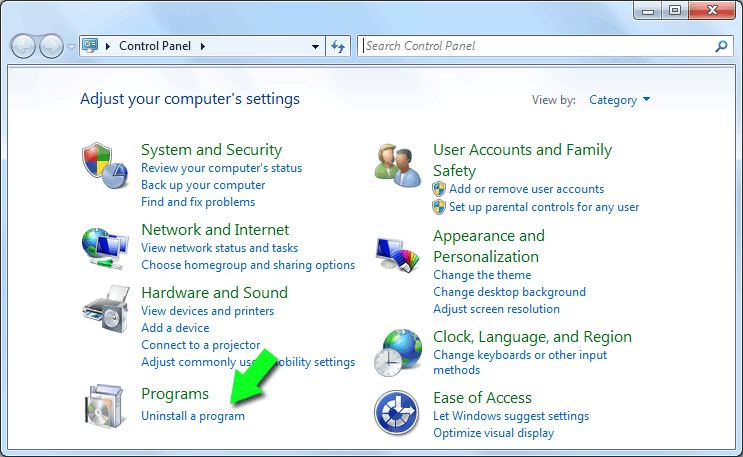 To completely uninstall PDF Converter from your PC, open your Windows Control panel and Select, "Uninstall a Program". Next (1) Select PDF Converter from the list of installed software on your PC. 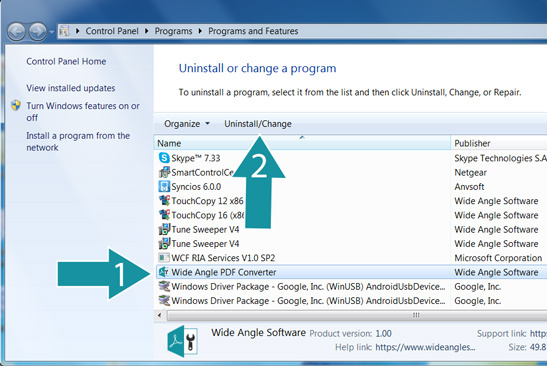 Then (2) click the "Uninstall" button. The PDF Converter uninstaller will then start. Follow the on-screen prompts to quickly remove all traces of PDF Converter from your computer. Thank you for trying PDF Converter. 2 free document saves / conversions. You can explore all of the functionality of the software with the free demo, but this version is restricted to saving or conversion of up to 2 document files. Fully registered software will run indefinitely and can be used with an unlimited number of PDFs. PDF Converter is fully registered when it has been activated with a purchased activation code.